Welcome to the month of stars and stripes, ladies. Tomorrow may be the Fourth of July, but the patriotic celebrations can last all month long. In today’s Style Tips you’ll see plenty of red, white, and blue, but the true spotlight is on raffia accessories. 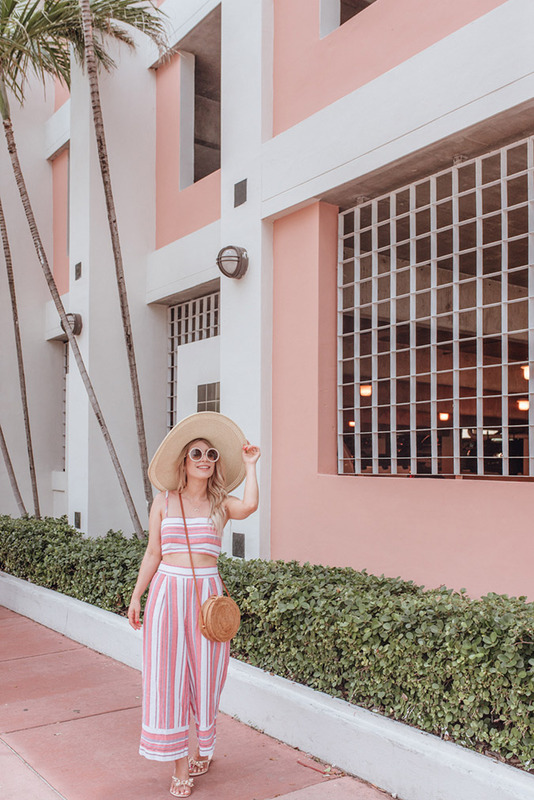 That’s right, straw handbags, espadrille wedges, and wide brim sunhats are dominating the summer fashion game. I guess we’re all ready for a little vacation…or at least an outfit that reminds us of a beach getaway. 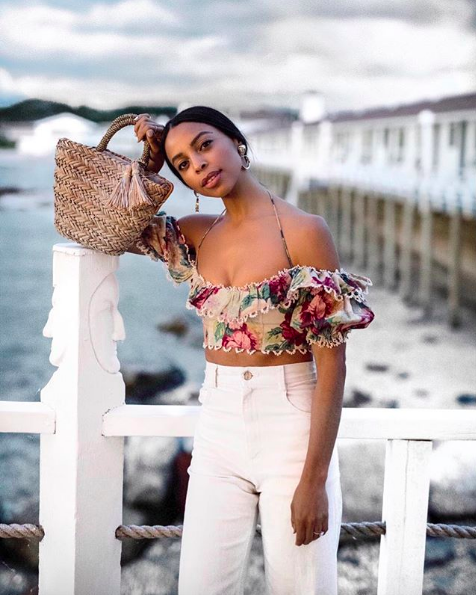 Below I’ve rounded up 10 fashion bloggers that encapsulate summertime perfectly through their wardrobe, something that I can certainly take a tip from. If you’re looking for some serious inspiration or to add a few more seasonal pieces into your own closet, be sure to keep scrolling. 1. Red, white and cute. You Fourth of July outfit may already be planned, but that doesn’t mean the patriotic colors have to stop there. Red, white and blue are colors that will be on trend all summer long. Think subtle pops of these colors just like Kate of Lonestar Southern in her adorable dress. How cute is this mommy and me duo? 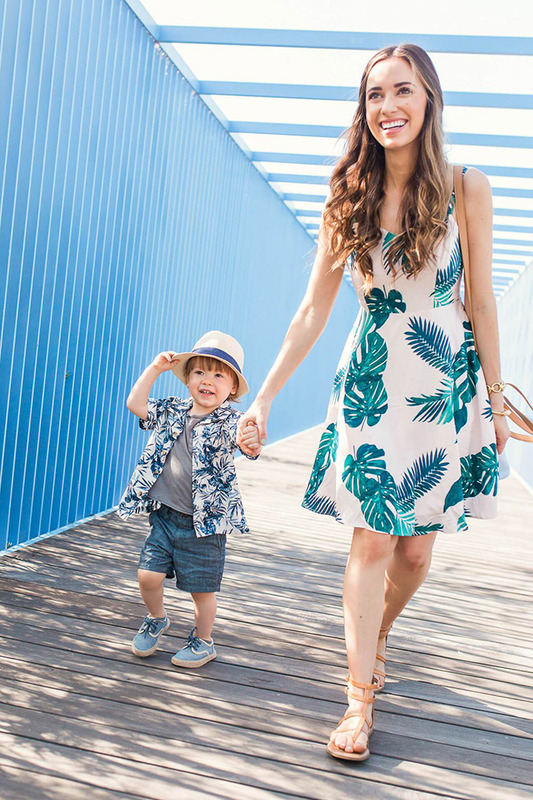 I love the idea of matching palm prints, especially if it involves a cute a breezy sundress like the one above on Mara of M Loves M.
3. Oversized on my mind. There’s nothing more classic than a white button up shirt. Why not put a fresh spin on a traditional piece like Sylvie Mus did in her oversized blouse, belted with an ultra-chic belt bag. Take a tip from Mother Nature this season and keep it natural. 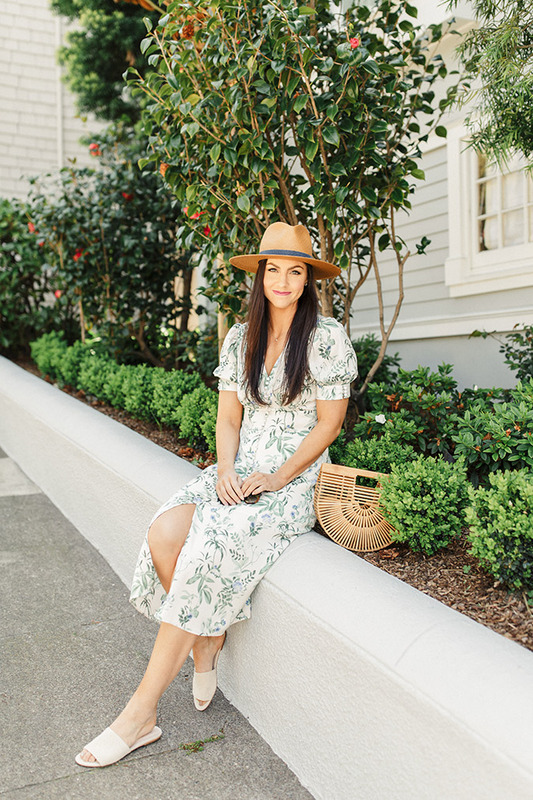 Jen of Freckles on Fillmore looks sweet in her neutral colored accessories and whimsical floral dress. Two-piece sets are proving to be summer’s favorite trend. Joëlle of La Petite Noob is looking pretty in pink in her coordinating crop top and high waisted pants. Don’t forget to peep her bow sandals, too! 6. Queen of the crop. Keep it cool all season long with chic crop tops. Pair them with high waisted jeans like Janelle of Wait You Need This for an easy breezy summer night out. Searching for the perfect summer party ensemble? Look no further. 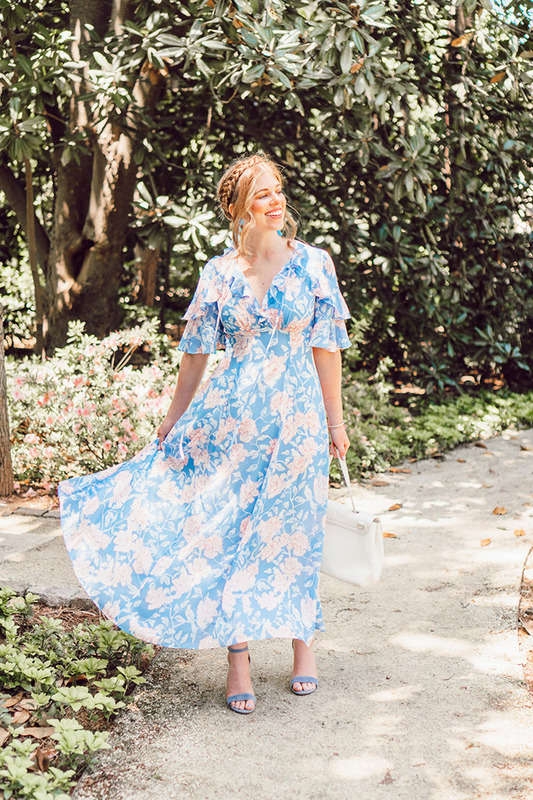 Laura of Louella Reese is twirling into the season in pops of blue. 8. Go with the flow. Add some interest to an everyday outfit by playing with textures and patterns. 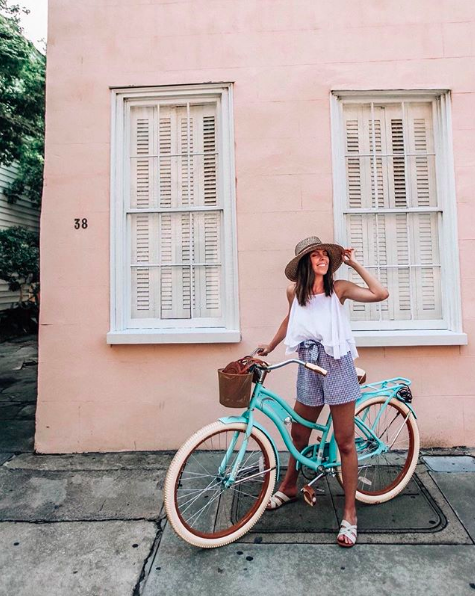 I love how Shelby of Pretty in The Pines paired her high waisted stripe shorts with a flowy tank. Swimsuit season is here, and why not take a fun little risk? I love the plunge on Emmy of Emmy & Hope’s punchy colored swimsuit, minimal accessories needed. 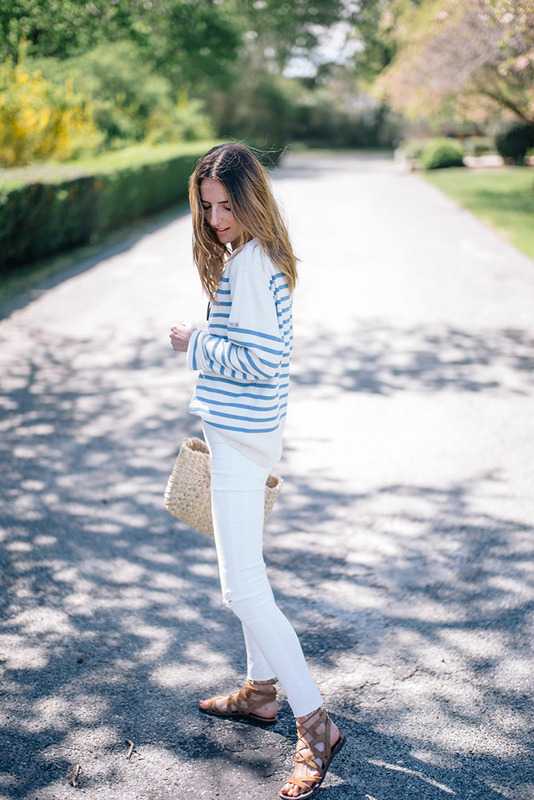 It goes without saying that stripes were made for summer. Jess Ann Kirby looks off duty cool in her sweater and gladiator sandals.